In the wake of decline in the brewing and weaving industries, Delft (literally, "moat") found a new life in trade to East Asia and in the production of Delftware, originally an earthenware China. Like brewing and weaving, these too have declined, but traces survive. 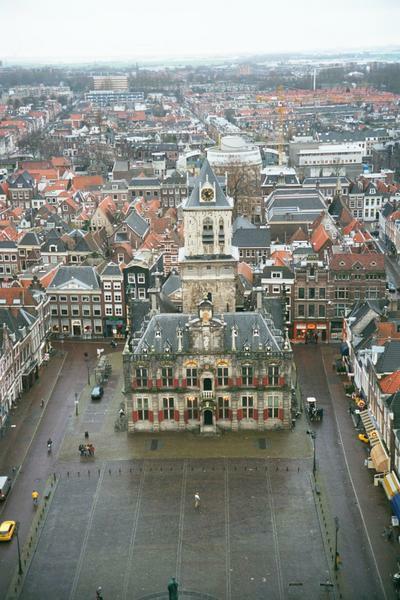 Turning west to the Markt and Stadhuis (town hall). The old city (Binnenstad) extends only a couple of blocks beyond the Stadhuis (the modern buildings are a good indicator). A railroad track, not visible here, marks the transition on the ground. 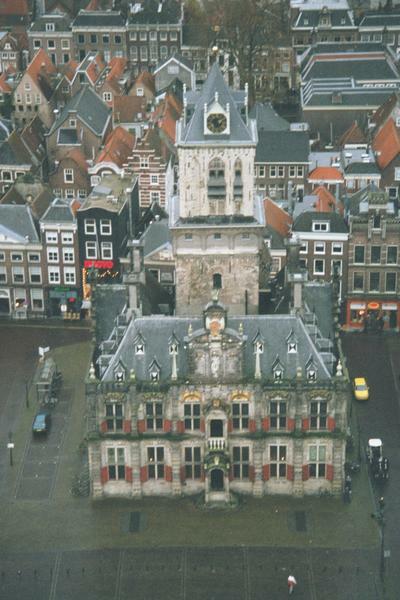 The town hall is really two structures: a medieval tower and a 17th century addition. On the ground, the addition dominates; from up here, it's hardly more than a facade. 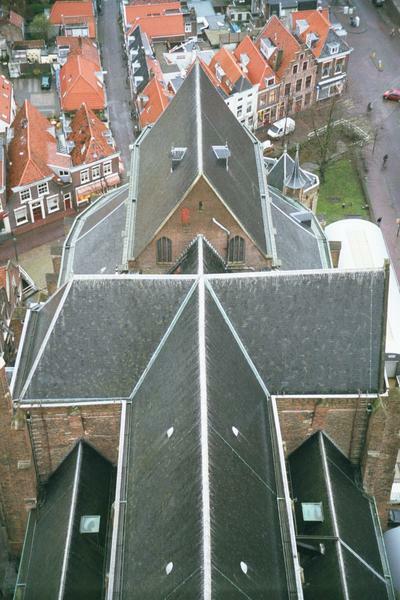 Looking northwesterly toward the Oude Kerk or St. Hippolytus Kerk, begun 1250. 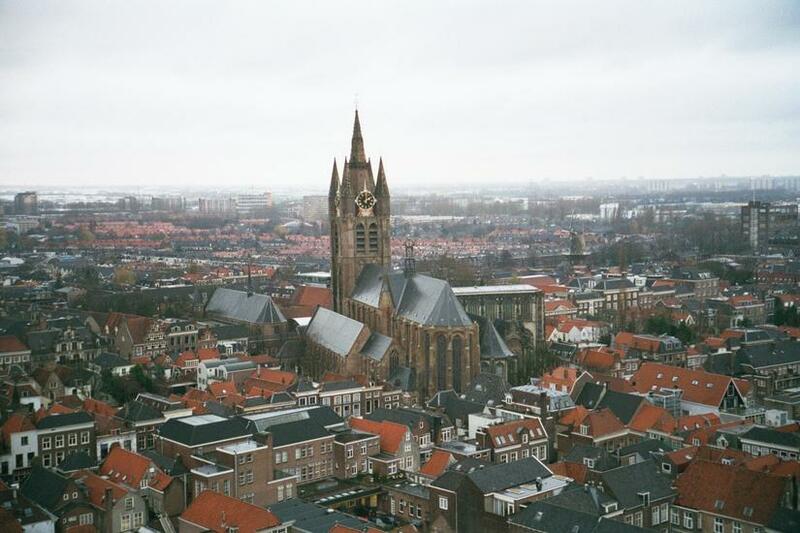 Vermeer is buried in it. Looking to the north, with a group of flagrantly modern buildings. They cluster behind the hard-to-see park called the Doelinplein, just to the right of the canal, near the pair of bridges. 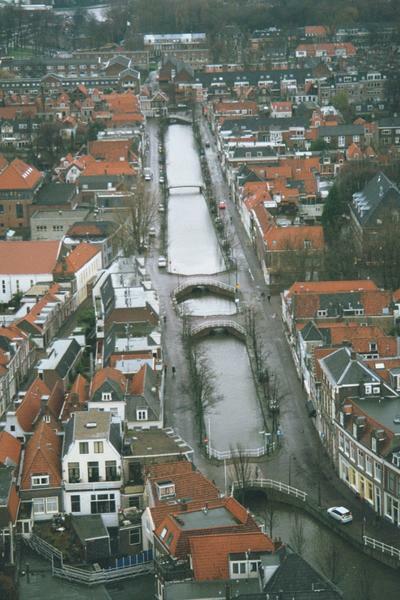 Close-up of the same canal, one of three main canals that trisect the old city and feed many branches. Looking southeasterly to the beestenmarkt, where animals were sold. 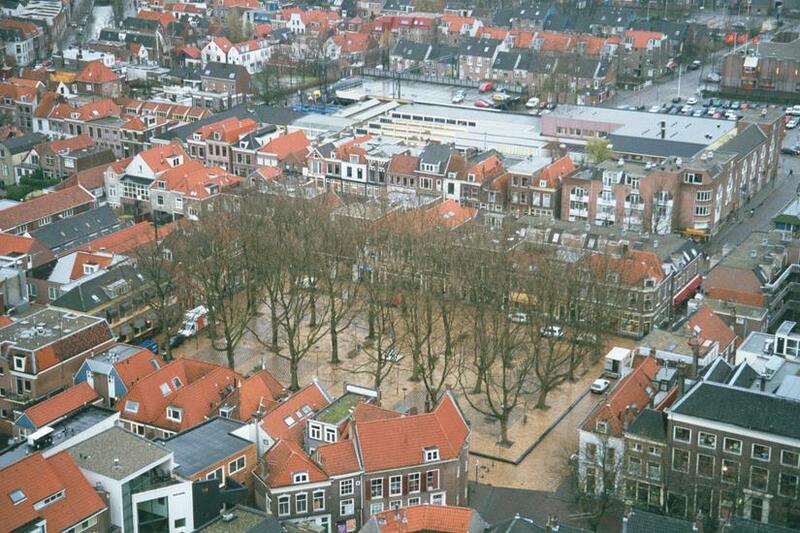 The inclusion of new buildings here, as behind the Doelinplein, is nothing new. 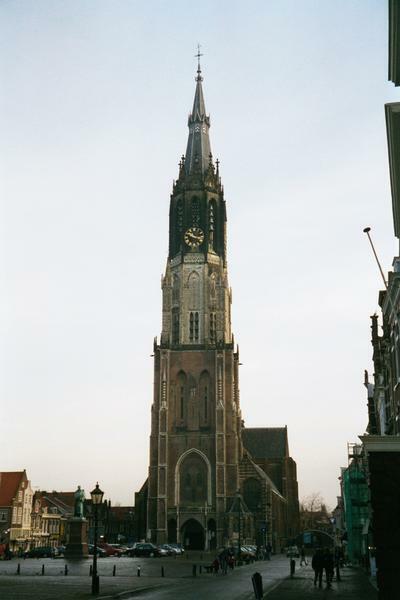 In earlier centuries Delft suffered not only the fire of 1536 but a catastrophic explosion of 90,000 pounds of gunpowder in 1654. That event not only demolished a large part of the town but blew the roof off the New Church and took the stained-glass windows with it. 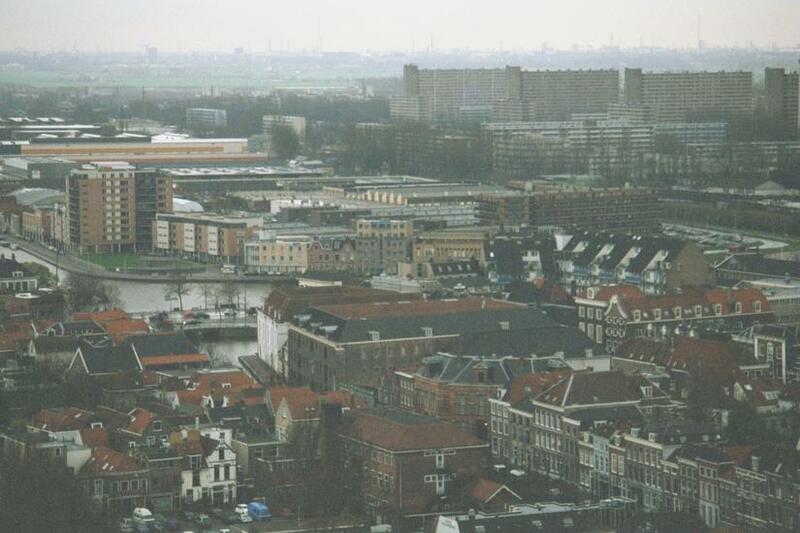 Looking southwesterly toward Delft's old harbor, the Kolk. 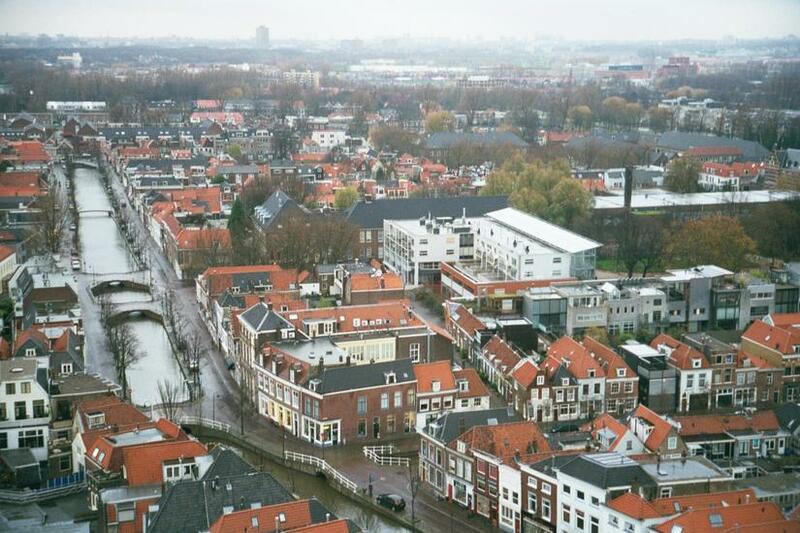 This is the southwestern edge of the old city, and from its far side Vermeer painted his iconic "View of Delft."